Krishna Udayasankar's third book in The Aryavarta Chronicles released last month and found its way into my hands last week. All three of her books have received the thumbs up from the press in New York and Singapore. I haven't read the first two books in this series, but I figured I would be just fine. After all, she retells one of the most famous epics in US mythology - The Mahabharata! 'Kurukshetra' is an interesting rendition of the US epic. This part of the chronicle mainly elaborates the famous war at Kurukshetra. The entire episode transpires in flashback and is discussed in a conclave of eminent sages in the second millennium BCE. The story begins before the war as Krishna makes multiple offers of peace to Syoddhan to avert a major battle between the Pandavas and the Kauravas. Syoddhan, however, rejects every such proposal on the advice of his dear uncle, Shakuni. Fearing an imminent war, Krishna endeavours to gather forces of loyal vassals and rulers of nearby lands. Neither Dharma nor Syoddhan truly desire war, and keep hoping against hope that they will arrive at peace without the loss of precious lives. Krishna, however, tells Dharma it is best to be prepared for the war as although preparation will make the war seem inevitable, it is the only way to prevent it. His intention is to gather enough allegiance for the Pandavas so as to compel Syoddhan into agreeing to his peace-treaty. Krishna also urges the eldest Kaurava to annul the infamous game of dice between the Pandavas and the Kauravas in which Dharma wagered his kingdom and his wife, Panchali, and lost both. Krishna's plan is not to merely reinstate the righteous Dharma as the king of Aryavarta but also to bring about a revolution. He dreams of a world where every human is treated equally and the leader is chosen by the people. The war that lasts 18 days finally takes place after Dharma rejects a final peace-brokerage effort from the Kauravas when the emissary mocks him. He understands that it is his duty to fight for justice and to give his people a peaceful life. Throughout the book, Krishna reiterates his ideology and tries to convince multiple people of the world he wishes for his countrymen. But most listeners, especially Syoddhan and the dangerous Devala Asita of the Firewright clan, refuse to believe him. Krishna has a dubious reputation of tricking people with his fancy words and ideas. It is only Draupadi who trusts him without a shade of doubt. Partha, the skilled archer and third of the Pandavas, has immense faith in his friend, Krishna, but even his trust falters as he sees his own kith and kin die before him on the battlefield. The novel has a surprise ending - one that we have never read or heard of before. There is also the mystery of the identity of the Secret Keeper of the Firewrights, which is not revealed until the very end of the book. Krishna Udayasankar has a remarkable hold over the language she has used to vividly describe scenes and build conversations in her book. Every dialogue is powerful and every sentence is steeped in meaning. She has done a lot of research from several sources and her interpretation is different in the way that she has done away with all supernatural elements from the story. She saves herself the trouble of coming up with an original story altogether, but makes up for that with her novel motive that binds her version of the story together. Many aspects in this book are different from what we have read/watched or learned of the traditional Mahabharata. Apart from the names (Arjun => Partha, Duryodhan => Syoddhan, etc. ), the essence of the characters and some relationships also differ. Syoddhan is portrayed as good person overall, with a humane sense of right and wrong. His agony at having to wage a war against his cousins and put at stake the lives of many innocents is acutely conspicuous in the book. Also, the bond shared between Panchali and Krishna is shown as being very complex. It has no name, although the story tricks one into thinking there is more to their friendship than meets the eye. What I absolutely love about this book is how lifelike every character is! Udayasankar shows how even good people lose their calm and succumb to the pressures of preserving self-worth and pride. Dharma's arrogance on certain days in the battle-command-tent and Abhimanyu's blood-lust (as he breaks into the wheel formation at the battle) that overtakes his ability to think logically, are some examples. But what redeems her literary work is her idea that there must have been a larger purpose behind the war of Kurukshetra. The idea of revolution, as expounded by Krishna, is uplifting, and lends the book a happy ending despite the grotesque killings, gut-wrenching blood loss and mindless destruction. The story is not all tragic and dispiriting, though. There are light and romantic moments too, especially between Uttara and Abhimanyu. Kurukshetra gets a full rating of 10 on 10 from me for doing justice to the original masterpiece whilst erecting a strong message as the backbone of the story. The book makes for a great read and is undeniably interesting. This review is part of the biggest Book Review Program for Indian Bloggers. Participate now to get free books! hopefully Kurukshetra (The Aryavarta Chronicles Book 3) - Review information can provide benefits for you in determining the gadgets that fit your needs in daily life. 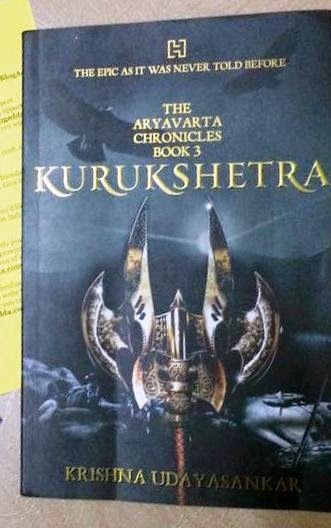 you just read Kurukshetra (The Aryavarta Chronicles Book 3) - Review if you feel this information is useful and want to bookmark or share it please use link https://innaz2.blogspot.com/2015/01/kurukshetra-aryavarta-chronicles-book-3.html if you want more information please search on other pages this blog.